Release price guide: Axis: bold as love on label Reprise with catalogue numnber RS 6281, Canada. Jimi Hendrix Record Value Release price guide: Axis: bold as love on label Reprise with catalogue numnber RS 6281, Canada. 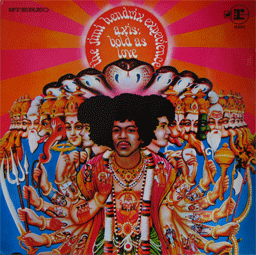 Axis: bold as love is the collectable edition of title Axis: bold as love recorded by Jimi Hendrix Experience. The record was published with catalogue number Reprise RS 6281. This pressing was released in Canada. This record was release on 1968-01-15. It was released as a LP (12") and appeared on the Reprise record label. The sleeve cover was designed by Roger Law. Our auction results for RS 6281 were last updated on 2019-03-03. Out of 716 auctions 315 items were sold. The best auction result was $315.00 On average $26.93 was the price paid for this record. This on the Reprise label WEA Music of Canada Ltd RS6281 (30725/30726) or (30,725)my old price guide said the USA Reprise was very valuable but didn't mention the Canadian one. Jimi Hendrix LP Axis Bold As Love NM Gatefold 1970 Psych Rock Guitar Orig! Jimi Hendrix Experience "Axis: Bold as Love" 1B/1A tri-labels VG++ 1st press! JIMI HENDRIX "Axis Bold As Love" US LP Orig 1968 Tri-color Label Gatefold Mint-!